SOUTHERN PINES, N.C. – November 17, 2017 – A full field of 124 hickory golfers from 23 states and Canada teed off this past weekend in the 14thAnnual Mid Pines Hickory Open Championship at Mid Pines Inn & Golf Club. The Hickory Open requires participants to use pre-1935 golf equipment, including wooden-shafted clubs. Players typically don period clothing including plus fours and ties. The event is played over three days on the Donald Ross-designed course, one that is valued among the best in North Carolina. Craig Stroup (Thomasville, N.C.) won first place in the Donald Ross Open Division with gross scores of 80-76-156. Mark Hollingsworth (Bluffton, S.C.) took second with gross scores of 77-81-158 and Rick Woeckener (Fredericksburg, Va.) finished third with gross scores of 81-78-159. In the Julius Boros Open Division, Richard Schmidt (Southern Pines, N.C.) won first place with net scores of 72-69-141. Ted Kopec (Niceville, Fla.) finished second with net scores of 71-73-144 and Jason Shaffer (Swartz Creek, Mich.) claimed third with net scores of 77-71-148. In the Skip Alexander Senior Division, Otey Crisman III (Rainsville, Ala.) won the division with gross scores of 76-81-157. Kim Mansfield (High Point, N.C.) finished second with gross scores of 78-82-160 and Hugh Cameron (Ontario, Canada) finished third with gross scores of 81-82-163. In the Bobby Jones Senior Division, Steve Kincaid (Blowing Rock, N.C.) won the division with net scores of 69-67-135. Ed Jackson (Ontario, Canada) finished second with net scores of 68-72-140 and Bob Georgiade (Durham, N.C.) nabbed third with net scores of 75-66-141. In the Old Tom Morris Super Senior Division, Larry Woods (Louisville, Ky.) won first place with gross scores of 85-79-164. Chris Deinlein (Greensboro, N.C.) finished second with gross scores of 87-85-172 and Michael Shiff (Parkland, Fla.) finished third with gross scores of 91-84-175. In the Walter Hagen Super Senior Division, Charles Mitchell Jr. (Okatie, S.C.) won first place with net scores of 70-71-141. James Clawson (Charlottesville, Va.) finished second with net scores of 76-69-145 and Tad Moore (Selma, Ala.) placed third with net scores of 72-75-147. Barbara Kopec (Niceville, Fla.) won the gold medal in the Peggy Kirk Bell Ladies Division with gross scores of 100-95-195. Marci Likens (Winter Springs, Fla.) won the gold medal with net scores of 83-77-160 and Roberta Robbins (Kenmore, Wash.) placed second with net scores of 81-87-168. On Friday, 16 teams competed in a Foursomes Competition at Pine Needles Lodge & Golf Club. In the Gross Division, Jeff Loh (Southern Pines, N.C.) and Michael Kee (Kannapolis, N.C.) took top honors, while Rich Genett (Flossmoor, Ill.) and Greg Ohlendorf (Beecher, Ill.) placed second. In the Net Division, Dave Dickman (Dennis, Mass.) and Jeff Blomstedt (Gill, Mass.) won first place while Tad Moore and Bill Martin (Perrineville, N.J.) finished second. Deal Hudson (Fairfax, Va.) and Natalie Wells (Winter Park, Fla.) each took top honors for Best Dressed. Nestled in the fragrant pine forest of North Carolina, you will find an experience unlike any other. For nearly a century, golfers have reveled in the serene ambiance of Pine Needles and Mid Pines Resorts. 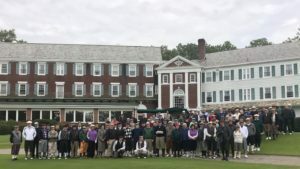 Two 18-hole Donald Ross designed golf courses have earned us our place among the country’s best golf resorts – and one to which our guests and USGA Championships return to time and again. For more information, visit http://www.pineneedles-midpines.com/.